Nessun dormouse: That’s all it took. This was a headline I wrote a while back that became a bit of a sensation. It was a by-the-numbers study about singing mice that for whatever reason found itself moving further and further forward in Metro’s book. Eventually, the challenge went out to the subs to think of song titles they would squeak. Remembering the old Pavarotti hit – probably the only operatic song I and many other football fans know – I pitched in with ‘Nessun dormouse’. There was a little laughter around the office and in it went in as the headline – above a BIG picture of a mouse. The full impact of this seemingly career-defining phrase was felt the next day when ‘nessun dormouse’ and mice songs began trending on Twitter and – because of the Pavarotti reference – became a talking point on Classic FM. Metro’s website put together a Storify version of the #mousesongs reaction that can be viewed here. I didn’t write the story. I didn’t sub it. But just that hook ‘Nessun Dormouse’ was enough to brighten enough people’s day to give the article make a much bigger impact. You can download a copy of the original Metro page here. 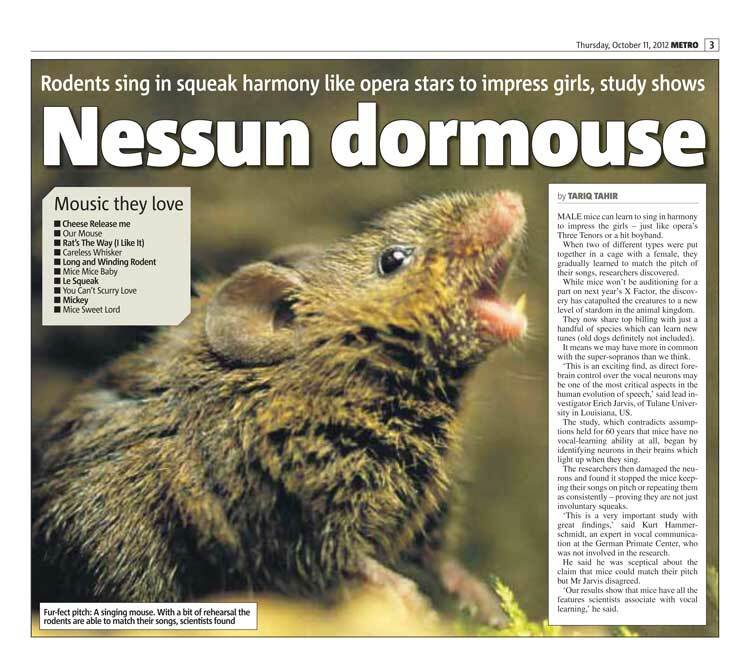 RT @metrouk: Male mice 'sing in harmony to impress females'. Headline: Nessun dormouse http://t.co/X6PoGQoH < brilliant headline!